Ten years ago, Dennis Aabo Sorensen had his hand amputated, after a severe fireworks injury. 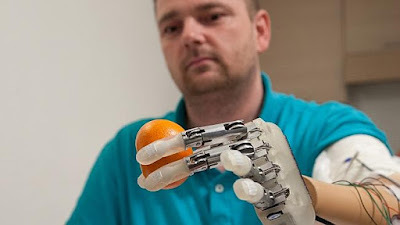 Last week he became the first person to “feel” smooth versus rough textures using a bionic fingertip. The bionic fingertip was surgically attached directly to Sorenson’s nervous system. "I could feel things that I hadn't been able to feel in over nine years." Researchers connected a postage-stamp-size artificial fingertip to electrodes surgically implanted to nerves in Sørensen's upper left arm above his stump. Sensors in the artificial fingertip generated electrical signals that were translated into a series of electrical spikes, emulating human nerve signals. Sorensen’s brain scans indicated that the sensations from the bionic fingertip accurately resemble the feeling of touch from real fingers. “This achievement will allow the “symbiosis” between the user and interface to become more adaptive (to changing tasks and situations), more robust (beyond interfering stimuli), more effective (learn from the past to anticipate or predict the future), and more natural (rapidly becoming part of the body scheme). The researchers have already integrated the new fingertip into a prosthetic hand and plan for patients to use the device before the end of 2016. In addition to creating prosthetics that can “feel,” the research team believes their technology will provide surgical, rescue and industrial robots the power of artificial touch. A new material could revolutionize robotics and prosthetics. In a separate study, a new material has been discovered that may yield soft, pliable, synthetic skin which can self-replicate. The Graphene-based cellular elastomer, known as “G-elastomer,” is highly sensitive to pressure and vibrations and responds more naturally than polyurethane foam or rubber. G-elastomer is more sensitive than human skin. Its unique, dynamic response was previously unknown in existing soft materials, and intrigued researchers Professor Dan Li and Dr Ling Qiu from the Monash Centre for Atomically Thin Materials (MCATM). Although we often take it for granted, the pressure sensors in our skin allow us to do things like hold a cup without dropping it, crushing it, or spilling the contents. The sensitivity and response time of G-elastomer could allow a prosthetic hand or a robot to be even more dexterous than a human, while the flexibility could allow us to create next generation flexible electronic devices. A team of Northwestern University researchers has found a way to 3-D print structures with G-elastomer nanoflakes, opening up new opportunities for regenerative engineering and other electronic, or medical, applications. Led by Ramille Shah, assistant professor of materials science and engineering at the McCormick School of Engineering and of surgery in the Feinberg School of Medicine, and her postdoctoral fellow Adam Jakus, the team developed a novel graphene-based ink that can be used to print large, robust 3-D structures. The research team populated one of the structures with stem cells to surprising results. Not only did the cells survive; they divided, proliferated, and morphed into neuron-like cells. The 3-D printed structure is also flexible and strong enough to be sutured directly to existing tissues, so it could be used for biodegradable sensors and medical implants. Across the United States, at Stanford University, Zhenan Bao, is developing an artificial skin that can feel, and heal the way a human’s does. The latest model has an in-built sensor that can detect and understand pressure changes on the same range as human skin. It is a flexible, skin-like material able to detect pressure and also transmit a signal to a component of the nervous system,” says Stanford's Andre Berndt. Prosthetics, wired to a human nervous system, that can feel texture. Artificial skin, more sensitive than human skin, that can heal itself.